Kitchens are funny rooms. They’re designed for utility, but they’re also given a special place as the “heart” of the home. They’re hospitable spaces, so it makes sense that even modern kitchens benefit from a lived-in element. Decorators have been injecting rustic details like corbels and chalk boards into kitchen design for a while, but I think one of the most interesting objects you can add to your kitchen is an antique or vintage sign. 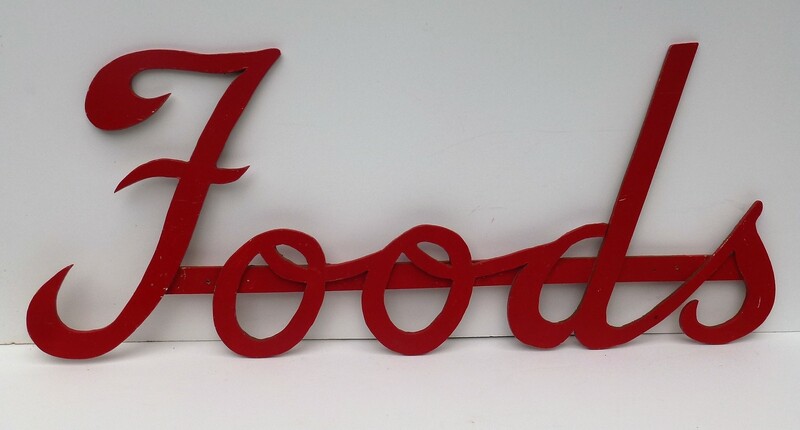 The best old signs to use in the kitchen relate directly to food. It’s a little on the nose but it works! Consider a painted wood sign. Collectivator seller Colin Paul Antiques has hand painted signs from a farmer’s fruit stand. One that sold quickly simply said “Delicious” – referring to the type of apple – but what a perfectly suited word for the kitchen! Signs saying “Carrots” and “Sauerkraut” are still available. 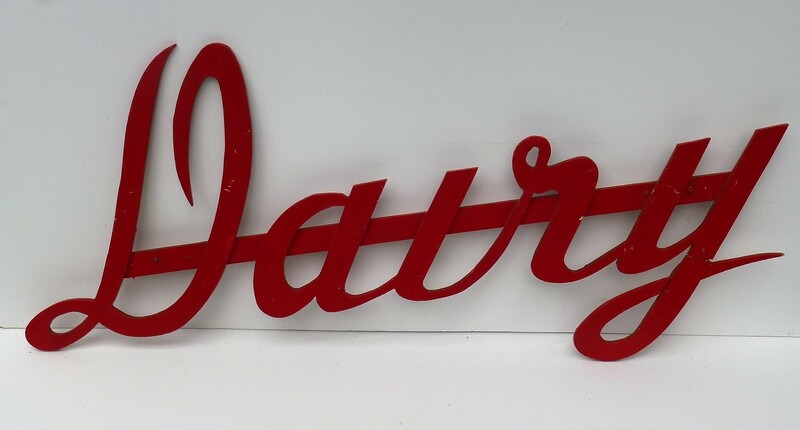 Also for sale are a series of handmade cursive script signs from a 1960s era grocery store. The font is mid century vintage, and with an assortment of words you can find something that really suits your taste (see what I did there?). Depending on your style you can find wood signs that work in vintage, country, or rustic “shabby chic” styled kitchens. While wood signs have always been popular, they were not very durable for outdoor use. By the end of the 19th century, signs started being mass produced in full colour porcelain and tin. Porcelain and tin signs are associated with national brands but they were also produced for smaller, local companies. Bisback Antiques, for instance, is offering a great 1950s ROE Feeds tin sign. Tin signs often have vibrant graphics that really stand out on a wall, not to mention their nostalgic appeal. One thing to note with wood and tin signs is the proliferation of reproductions. Homey “family” messages on faux aged wood and reprinted tin signs are in decor shops everywhere. In general, these signs are sold as new and I don’t really have a problem with them, but they usually strike me as a poor imitation. I still think it’s worth the effort and money to buy the real thing. Old signs have a story. They are cultural and commercial artifacts. I also find the chips in the paint, the dents in the tin, and even the marks from where the sign was mounted add to the visual appeal. Now say you want to have an authentic sign, but you want to start at a lower price point. In this case, a great thing to look for is antique and vintage shipping crate labels. Sometimes they will be framed, but often they will not. Unlike the unique painted wood signs, shipping labels were mass printed. The extras you find still have vibrant images of landscapes and appetizing produce that work beautifully in a kitchen. They are a fairly common item and usually cost only between $10 – $100. “Daisy Mills” and “Surety Apples” labels for sale. I bought a “Zenith” shipping label at the Pickering Markets for $20. I love the apple and how it represents a Canadian company. My friend found framed shipping labels at a local group shop for similar prices. There are so many labels out there that can really add interest to your kitchen without breaking the bank. 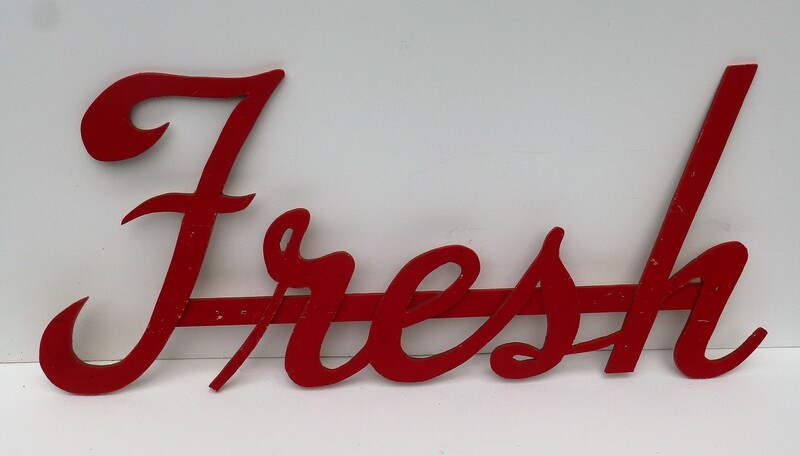 Whether the sign is on wood, tin or paper, as with any collectible there is room to grow in rarity and price. Signs can truly be works of art. They can be one of a kind. In the upper end, antique signs can easily cost thousands of dollars. Take a look at this gorgeous 1920s general store sign from J.C. Miller Antiques . It ticks all the boxes – colour, content, and beautifully weathered age. 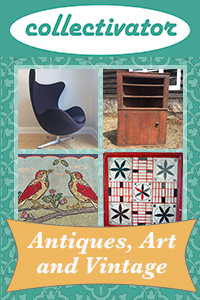 Vintage and antique signs are sought after by decorators looking for that one amazing piece, or collectors who have a space on the wall (and isn’t there always room for just one more?). With a little effort, you can find an a sign that speaks to you. Whatever your style or budget, old signs and kitchens are a match made in heaven.